An Australian flying instructor has become the first pilot in the world to achieve 1,000 flight hours on both the ARH Tiger and the NH90, known as the MRH Taipan in Australia. Matt Barker, an Airbus qualified flying instructor (QFI) and former Army pilot, reached this milestone while supporting the Australian Defence Force on an MRH Taipan training exercise at the Shoalwater Bay Training Area in central Queensland. Barker’s 1,000 flight hours in the MRH followed his earlier achievement of 1,000 flight hours in the ARH Tiger. He is an Airbus MRH90 Taipan QFI at the Army Aviation Training Centre in Oakey, Queensland. Barker started his flying career in the Australian Army as a Specialist Service Officer Pilot in October 1987. He was the lead military instructor during the Australian Army’s introduction of the ARH Tiger into service, working with Airbus in Marignane, France in 2004-05. 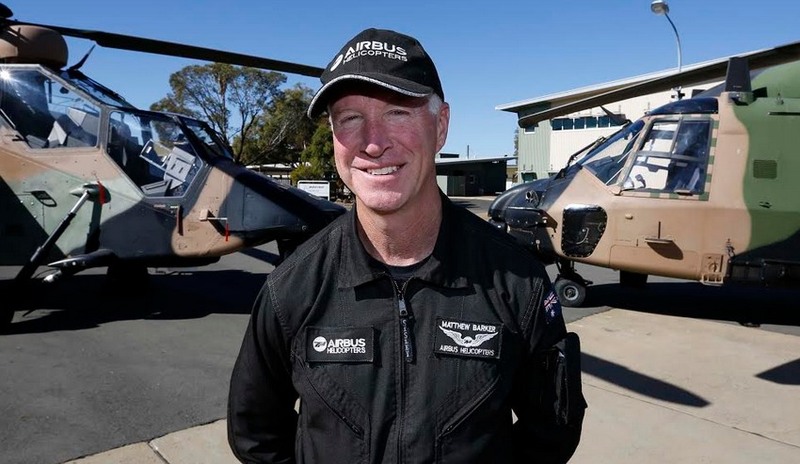 After 26 years of service with the ADF, Barker transitioned from the Army to Airbus in 2013 and continued his role as an ARH Tiger QFI, with a transition onto MRH90 in 2014. Deanne Barnett, Airbus vice president governmental helicopters for Australia and the Pacific, said Barker had been an integral and important instructor and mentor for Army’s next generation of MRH Taipan pilots. “Following a highly regarded career with the Australian Defence Force, Airbus proudly brought Matt into the company so he could continue teaching the country’s future helicopter pilots,” she said. Barker said he enjoyed teaching and passing on the lessons he’d learnt. “I enjoy being part of the Army flying system. If I could pass on one piece of advice for the young aircrew it would be to make sure you keep having fun,” he said. More than half of Barker’s 8,150 flying hours have been achieved on Airbus helicopters, with 2,275 hours on the AS350 Squirrel in addition to his 1,000 hours on both the MRH Taipan and ARH Tiger.